While the writers of Dexter are already writing the script of the first 4 episodes of Season 7, the filming of the forthcoming season is set to start in May. According to sources, season seven will start shooting few days earlier, than last year. Until now, the official premiere date of Dexter Season 7 is still unknown. What Bruna said. Minus the Heiling. So is the other chair. This is an old picture silly. It's a sign that she was filming her scene when this picture was taken. Can't wait, love Dex!! Hurry the f*** up!!! Season 7 premiere episode can't get here too soon. Can't wait! I cant wait for it! Big Hi from Portugal! 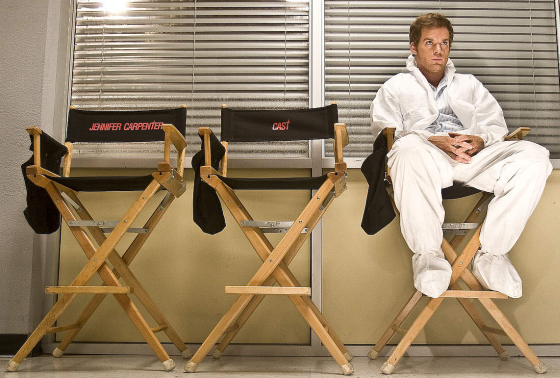 I want to see Dexter back in that white jumpsuit again in season 7, with the dummies and gallons of fake blood. We must see him in the blood room at the station. I love those scenes, because they mimic the Kill Room and Dexter gets to pantomime different techniques for murder while at work. One of my favorite scenes in the series is when Dexter splashes the blood all over Deb, trying to figure out the one murder, and she screams and giggles and he starts laughing with her. It's one of those moments when Dexter becomes the person he is supposed to be. The way he is looking at Deb and laughing is so warm, genuine, and "human". Those moments only ever seem to come out of him when Deb is around.